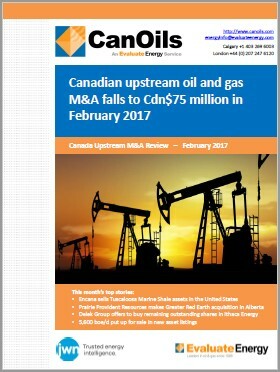 This report, created using all of CanOils' databases, focuses on the upstream M&A activity of Canada's oil and gas companies in February 2017. Alongside an industry overview, CanOils data and industry trends have been used to analyse all of the biggest deals of the month, providing you with an extremely comprehensive overview of all potential, agreed and completed Canadian upstream mergers and acquisitions this month, as well as an in-depth look at some assets that have been put up for sale. Encana Corp. sells Tuscaloosa Marine Shale assets in the U.S.